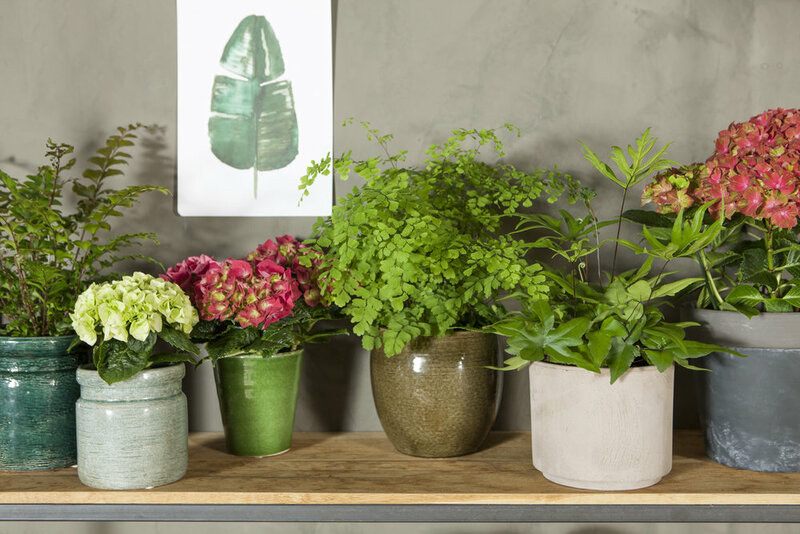 Did you know that the indoor hydrangea is much more than just a beautiful plant? No other plant releases as much moisture as the indoor hydrangea. The Latin name Hydrangea literally means water barrel: ‘hydro’ (water) and ‘angeion’ (barrel or jug). The plant’s moisture-regulating properties increases indoor humidity and provides better air quality, especially helpful for treating dry skin, headaches and dry eyes. Ever heard that different colours impact our mood? The many different colours of hydrangeas - ranging from delicate pastel pink to sky blue - provide a relaxing and soothing atmosphere to the home space. Ideal for bringing a sense of wellbeing and calm to the bedroom or living room. The houseplant should find a place with plenty of natural light. However, especially in the summer, take care that it is not exposed to direct sunlight. The indoor hydrangea is a water loving plant and needs to have plenty of moisture in the soil. An immersion bath once or twice a week works well. The hydrangea likes fresh, fairly moist air. Avoid placing it near the heating.